This post was updated on 03-27-2017. The previous version didn’t stress enough that this cheat sauce DOESN’T resemble real dulce de leche. 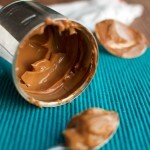 Hmmm, a fast dulce de leche cheat that allows you to make dulce de leche in less than 10 minutes. Is it possible?? Well, I tried this recipe, because all of the methods for making dulce de leche that I’ve tried take a long time, ranging from 2 and a half hours to 7 (!) hours! I figured that there must be some way around the long wait. There had to be a way to make dulce de leche a little faster, right? This recipe DOES NOT make dulce de leche. There is no fast way to make the stuff. My experimental dulce de leche cheat sauce was not quite an epic fail, but it sure as hell wasn’t dulce de leche. Guess what I found out recently when I was trying to make dulce de leche from scratch: caramelizing sugar is one thing, but ‘caramelizing’ something else, be it milk, meat or bread, is something else entirely! Just a little heads up, things may get a little nerdy from here on. As we all know, water can’t get hotter than 100°C/212°F. Most sugars (with the exception of fructose) only start caramelizing at a temperature of 160°C/320°F. This means that when you’re cooking sweetened, condensed milk in a water bath, the sugar in the sweetened, condensed milk doesn’t actually get hot enough to caramelize, as when you’re making a dry or wet caramel. But hey, if the sugar doesn’t caramelize, where does the brown color come from? I’ll tell you. There’s another browning process involved. The Maillard reaction. Sounds pretty scientific, doesn’t it? Well, that’s because it is! Whereas ‘caramelization’ only refers to the browning of sugars, the Maillard reaction occurs when sugars and proteins are heated together. As the sugars react with the proteins, a complex mixture of different molecules responsible for a range of flavors and odors is formed. In other words: sugar + protein = deliciousness! 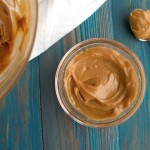 This is why it takes so ridiculously long to make dulce de leche! It is not the sugar in the milk that caramelizes, it is the sugar and the proteins in the milk that react together to create delicious molecules! So that’s where the brown color and the complex flavor comes from when you cook sweetened, condensed milk in a water bath! But what about the texture? How does a closed can of sweetened, condensed milk change from thick but very runny to pudding-like? I mean, if the can is closed, and water can’t evaporate, how can it thicken so much? And why doesn’t this change occur when I make dulce de leche in a pan over a flame? I think I know… Like I said, when you’re cooking dulce de leche in a water bath, it cannot get hotter than 100°C/212°F, or maybe a little hotter when you cook it in a closed can. As a result of this, the sugar doesn’t caramelize. However, this doesn’t mean that the sugar doesn’t change! I have a book about cooking with sugar. ‘Sugarbaby’, by Gesine Bullock-Prado. From reading this book, I learned that when sugar is combined with proteins (such as milk), sugar “delays the coagulation of the protein structure” and allows things such as custard to thicken properly. It also stabilizes the mixture by “dispersing the proteins”. In other words, sugar acts as a stabilizer and a thickener when you cook sweetened, condensed milk in a water bath. This ensures that the resulting dulce de leche turns out beautifully thick and puddingy! But what does that mean? That means that dulce de leche – at least the way I like it – cannot be cooked faster, because exposing the sweetened, condensed milk to higher temperatures would simply result in a different end product. This is one of those very different end products. In this experiment, I simply caramelized sugar in a pan and added evaporated milk, thinking that, as sweetened condensed milk is just evaporated milk and sugar, it ought to work. As a result, all of the sugar in this sauce has been caramelized and did not have a chance to react with any proteins. Which means that the brown color of this sauce and the complex caramel flavor all comes from regular caramelization. Not from the Maillard reaction. This also means that this kitchen experiment doesn’t have the same pudding-like consistency actual dulce de leche has, because all of the sugar in it has been taken up to a temperature of 160°C/320°F and has lost its thickening and stabilizing properties. Apparently, when it comes to dulce de leche, you don’t want to rush it, otherwise it just won’t work! So this ‘cheat sauce’ is basically a simple caramel sauce, but with evaporated milk instead of cream, and a little butter. I’ve included the recipe so you can make it at home and find out for yourself that no, there is no such thing as a fast dulce de leche cheat. And I wouldn’t make this if I wanted an ordinary caramel recipe for drizzlign over ice ceram or something either. I’d much rather use a delicious cream-based caramel, such as this one, for that. Like this post, click here to sign up to my mailing list. 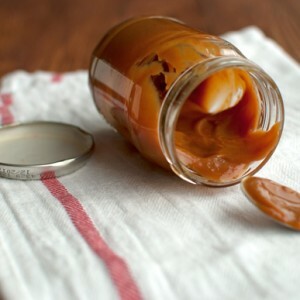 Caramel sauce made with evaporated milk instead of cream in the hopes that it would resemble dulce de leche. Add the sugar to a large saucepan. Heat over medium-high heat. At some point, you will notice that the sugar around the sides of the pan will start to melt. Start stirring with a heatproof rubber spatula at this point. 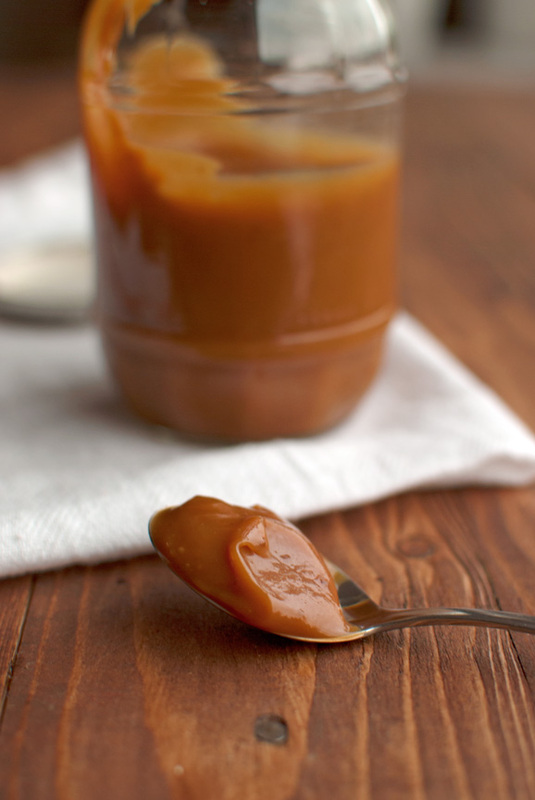 This fake dulce de leche sauce stays soft and spreadable, even if you keep it in the fridge. Can be stored in an airtight container in the fridge for up to 3 weeks. I’ve been told that the real deal – starting with milk and sugar, not condensed milk – tastes even better. I just don’t have the patience to make it. Hi Kelster, I’ve tried to make dulce de leche from whole milk and sugar about 7 times over the past couple of weeks, but each of those batches turned out very disappointing. They either didn’t brown properly (not even after 7 hours of cooking!) or they had a different texture and taste than the dulce de leche you can make by boiling a can of sweetened, condensed milk. And like you said: it takes a lot of patience! Especially the 7 hour method! Let’s go to South America! I guess you’re right: time to learn from some authentic South-American madres! I wanted to comment and thank you for all the nerdy talk. I love understanding the why and how of cooking, because then I can do more. Also, in regards to doing a water bath in a slow cooker, you totally can! I use pyrex to hold whatever I want to cook and then put the water around the pyrex. It works really well for steel cut oats 🙂 I’m new to your site and I’m excited to take a look around. Hi Anna, thank you so much! I love to let my inner nerd out every now and then. Especially when there’s dulce de leche involved 🙂 Anyway, if you like nerdy things, take a look at my ‘Battle of the Buttercreams‘ and my brand new series about the ‘Different Kinds of Meringue‘! Oh, and thanks for the great tip on making a water bath in a slow cooker! Do you also prepare other kinds of food in the slow cooker that way? Or just the oats? Thank you for posting the different methods you’ve tried! Are you able to share how “different” or “similar” this 10 mins version is when compared to the pressure cooked one? Hi Renee, nice to meet you! The 10-minute dulce de leche version is actually quite different than actual dulce de leche. As I explain in my series on dulce de leche, when you’re making dulce de leche the right way, the sugars in the sweetened condensed milk react with the protein of the milk. This is called the Maillard reaction and it gives the dulce de leche that typical caramelized milk flavor. I’m also under the impression that this reaction causes the mixture to thicken. The 10-minute cheat sauce is made by adding evaporated milk to a basic caramel. This obviously gives the caramel cheat sauce a milky flavor and a thicker texture, but because the milk is never allowed to caramelize (the Maillard reaction doesn’t occur) it is just not the same. 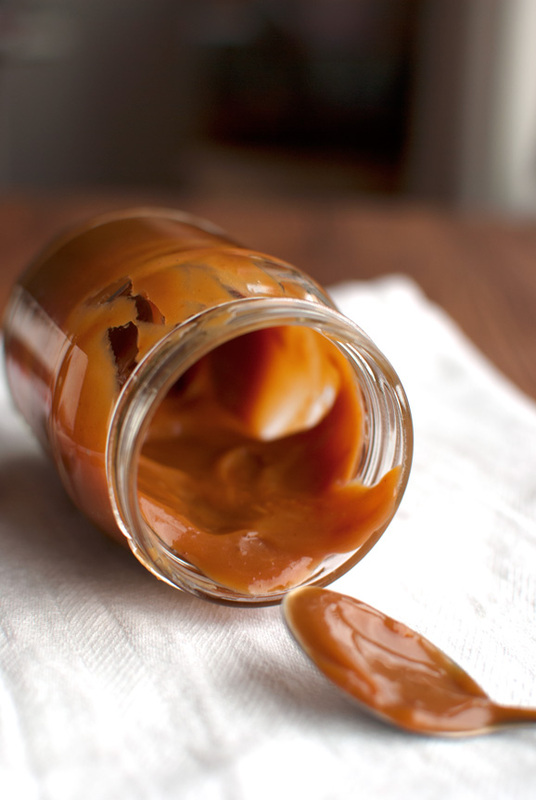 Real dulce de leche is almost as thick as pudding, whereas the cheat sauce is quite thin. It’s definitely thick enough to coat a spoon and hold its shape, but it has a more custard-like consistency. 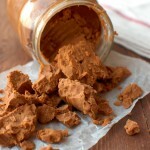 It stays soft and spreadable even when stored in the fridge, whereas real dulce de leche tends to become too thick to spread easily if you keep it in the fridge. Flavor wise, the cheat sauce is not as good as real dulce de leche. Ihave to be honest about that… Don’t get me wrong, it tastes great (milky caramel) but it lacks the deep caramelized milk notes of real dulce de leche. However, like you say, it’s a great alternative if you don’t have time to make the real stuff! Can I use just plain white powdered sugar? Thanks! Hi Izzie, I don’t think you can use powdered sugar instead of the granulated sugar. I haven’t tried it, so I’m not 100% sure, but my guess is that the powdered sugar will burn against the sides of the pan the minute you start heating it. Not only because the sugar crystals are too small, but also because most powdered sugars contain an anti-caking agent, such as cornstarch. 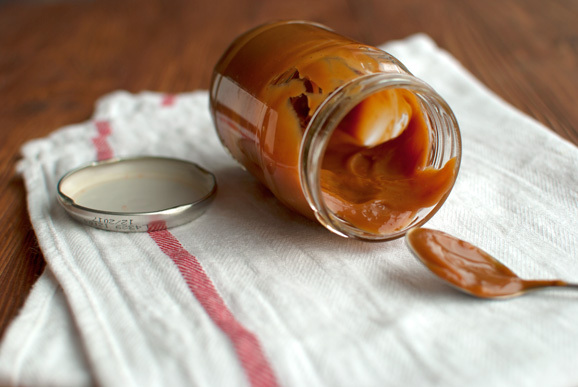 Is this dulce de leche ideal for filling macarons? Does it hold it shape easily? Thanks! Hi Karen! No, I wouldn’t use this to fill macarons. It’s a lot softer than real dulce de leche. It’s really more of a sauce. Try drizzling it over ice cream or eat it on toast! Nice to meet you, Jaroslaw! Thank you so much! I’m so proud of my little puppy! Anyway, to answer your question: the pictures in the post actually are pictures of the 10-min cheat sauce. It’s quite thick for a sauce, but not nearly as thick as real dulce de leche. 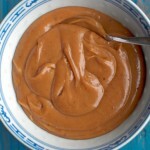 Real dulce de leche (like dulce de leche made in a can) is almost as thick as pudding, and the texture and thickness of this cheat sauce is more like that of a basic custard. Well Nila I have made this four times now, with different friends. I came up with the perfect recipe for me. I use 1 cup of sugar so I can use the entire 12 oz can of evaporated milk (no leftovers) 6 T of butter of course. I like 1/4 tsp sea salt mixed in after the sugar liquefies. I also like 2 Tbsps water mixed in to the sugar before it is heated up – It gives me less lumps. The sugar gets pretty hot so I like a long handled wooden spoon. It is much longer than my silicone spatula handle. Of course a double recipe is a little harder to stir at the end. I’ve also discovered that if the sauce is not thick enough after it is cooled to room temperature, I can return it to the stove for several minutes more with no harm done. Everyone raves about how good this is which i cob\ncur, but I like how much better AND cheaper it is than any store bought caramel sauce. Thanks so much. Hi Jaroslaw, it’s so nice to hear back from you! 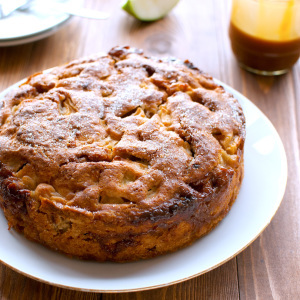 I’m so glad you like the recipe so much and took the time to make it your own! That’s awesome 🙂 I also love that you’ve found out that you can thicken the sauce on the stove after it has cooled to room temperature. I’ll make note of it in the recipe! Thanks for posting this! I made the same doubled recipe and it tastes incredible, but it’s reeeeeally runny. Like it runs right off my toast. I’ve already tried returning it to the stove and cooking longer, but it still cools into a definite liquid. Any idea what I did wrong? Hi! Came across your blog as I searched for dulce de leche recipes as I’m looking for a caramel topping I can pipe on top of cupcakes. Do you think that the consistency of this will enable me to pipe it or is it too runny? This caramel is not particularly runny, but it is quite thin. So, I guess it all depends on how you want to decorate the cupcakes. If you want to pipe fine lines, I bet this caramel is a great option, as is my Salted Caramel Sauce, which is also a bit easier to make. However, if you want big, fluffy swirls on top of your cupcakes, I’d suggest making a caramel buttercream instead. 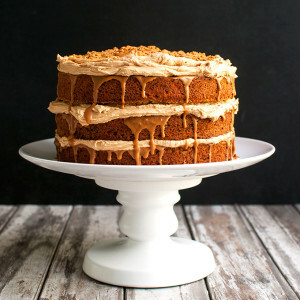 Real dulce de leche is probably a bit too thick to pipe when cool (and too soft when warm), but if you combine caramel (such as my Salted Caramel Sauce, with or without the salt) with soft butter and whip it, you’ll get a gorgeous caramel buttercream. Add as much or as little butter as needed to reach the desired consistency! Can I use condensed milk instead? Will it be thicker? Hi Ben, condensed milk is usually sweetened already, so I wouldn’t recommend using it in this recipe. Quick and easy, just as promised. I followed instructions exactly, including “Start stirring with a rubber spatula at this point,” even though I wondered about that. Well, the tip of my heirloom white rubber spatula is now permanently burned brown from this experiment. I’ll follow my instincts next time, but otherwise you have a very nice website and many interesting concoctions, so thanks for your contributions and I hope you continue. Hi DulceTester. Your spatula burned??? Wow, that’s never happened to me. I’m so sorry that happened. I’ll make sure to make note of it in the recipe… Maybe you can only use new rubber spatulas? Well, there were no flames! But there’s now a dark brown coloring for a little less than 1 cm on the tip edge of the otherwise white rubber where it came in contact with the hottest parts. As I said, this is an old heirloom tool that’s been in the family for decades, not a new one. I’ll use a metal spoon for any stirring from now on, unless I get a heat-resistant new spatula. Thanks for the information DulceTester. I’ll make sure to make note of it. So I followed is to a T…and it came out pretty bitter. I added a little more sugar and it was still bitter. Anyone else get this outcome, or is there a specific mistake I could’ve made without realizing that tends to make it bitter? 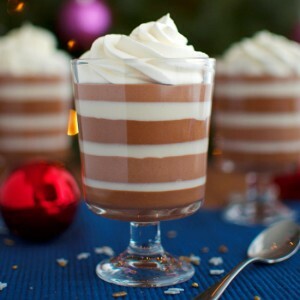 Just wondering, since I made this to put in my peruvian Alfajores cookies, and my peruvian boyfriend said it was a little bitter, almost chocolate tasting…any input?? This didn’t work! It was way too runny it’s not at all what is pictured in your photos. Do you have any tips for next time? Hi Kyla, I’m sorry the recipe didn’t work for you. In fact, this is turning out to be quite a finicky recipe. Try cooking the caramel a bit longer after you added the milk. That will probably thicken it slightly. Let me know how it turns out! Hi! Thanks for this recipe! I made this last night and the taste is delicious, but the consistency is super runny. Do you have an tips on how I can thicken it up? Try cooking the caramel for a bit longer after you’ve added the milk, Jenny! Can this be used in a recipe for cooked de arequipe??? Can you respond pretty soon, as this is needed for a recipe I need to prepare tonight!!! Sorry HALP, didn’t check my comments until today. 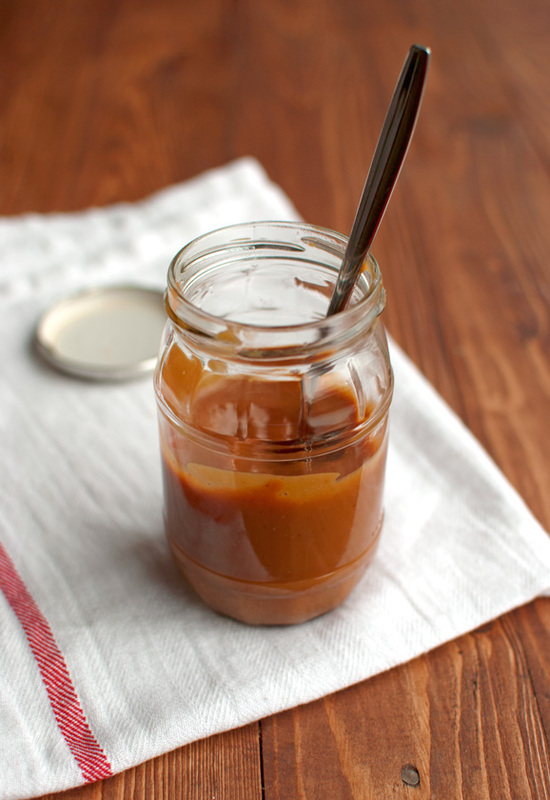 This is a cheat sauce, and it’s kind of similar to dulce de leche, but not quite the same. I actually prefer the real stuff. It’s okay. The recipe worked out great, although if you use it in a recipe requiring dulce de leche as a key ingredient, keep in mind that this will not harden and has the potential to not be as thick. This could impact the final product, but it still cooks the same. Thank you! Uhh it melted my spatula. I was going to bring cupcakes to my family but I won’t bring them if they have melted plastic spatula in them. On top of that it may have ruined my pan. Mine came out sort of chunky… like not clumps of sugar almost like maybe adding the milk cooled some spots too fast and they cooked differently after? Any advice? Can I reheat it on the stove to get it to thicken like tomorrow? Or is that a bad idea? Hi Marissa, a bit late with this reply probably (I’ve been sick) but yes, you could have gently warmed the sauce to melt the sugar clumps. Check out this post for my tips for making caramel.